The Hated proved why every player matters in Underdog. 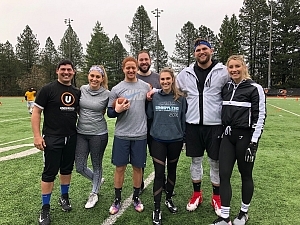 The Hated and Blood, Sweat and Beers faced off in the closest flag football game this week. When the dust--or rain this week--settled, The Hated won, 61-60. It took every team member doing his or her job on every play to win such a tight contest. Mariah Leeson was integral to this success, and her great work in a great game earns this week's honor.